Click here to read the essay "Ornithology + Allegory: The Work of Walton Ford" by Barbara Larson. In his paintings and prints, Walton Ford references the nineteenth-century illustrations of naturalists such as John James Audubon, while adding his own modern-day twist. His beautiful images of flora and fauna are complex narratives, wryly critiquing colonialism, industrialism, politics, and our relationship with the environment. The four limited-edition prints on view at the NAS are part of a larger set exhibited at the Whitney Museum of American Art in 2005. Walton Ford has had a strong interest in art and the natural world since childhood. A graduate of the Rhode Island School of Design, he is the recipient of several national awards and honors including fellowships from the Guggenheim Foundation and the National Endowment for the Arts. His first major one-man show was at the Brooklyn Museum in 2006. After living in New York City for more than a decade, Ford and his family have settled in the southern Berkshire Mountains of Massachusetts. Once numerous, the brightly-colored Cuban red macaw is now extinct. 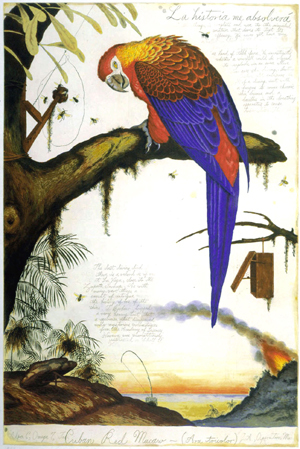 Walton Ford’s solitary, splendidly feathered macaw sits on a branch, beset by pesky flies and surrounded by various traps to capture him. The clue to the allegory is the title, “La historia me absolvera” which means “history will absolve me.” This was Fidel Castro’s final statement in a lengthy declaration against the abuses and corruption of the Batista government, delivered in 1953 as his self-defense during a secret trial after the failed attack on an army barracks in Santiago, Cuba. Sentenced to fifteen years in prison, Castro was released two years later under a general amnesty for political prisoners; four years after that, Batista fled as Castro’s forces seized Havana. Attempts to oust Castro by force or assassination in the early 1960s failed. Ford here illustrates these attempts to unseat Castro as flies and traps, and adds a text about bomb-rigged seashells and a fungus-impregnated diving suit. But only the future will answer Castro’s defiant statement of 1953.